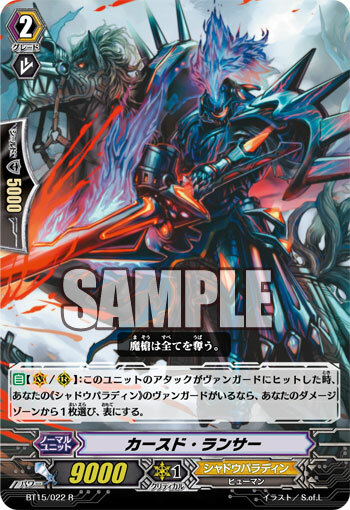 [AUTO](VC/RC):When this unit's attack hits a vanguard, if you have a «Shadow Paladin» vanguard, choose a card from your damage zone, and turn it face up. "A demonic lance deprives all." A jet-black knight who carries a cursed magical lance. Once, he was a great knight who commanded holy powers, but one day he got his hands on the magical lance he now carries. He tried to use it to protect those he loved, but instead it ate his soul, not knowing it feasts on negative emotions.. This weapon consumes the negative emotions of those who wield it, and in return, bestows upon them, the power of darkness. The desire to protect others was deemed “Greed”, and thus this man who desired power suffered a cruel, bad ending. However, his reasons weren’t the problem. It was the fact that he desired power, that he lusted for the lance from the moment he saw it, that he ended up drowning in the depths of darkness. “Deprive all”… … Those were the words engraved on the altar where the magical lance was sealed… it isn’t aimed at just the enemy, but the lance’s master, as well. The soul of the holy knight was tainted black, and neither his body or soul resemble the man he once was. Perhaps, sinking into darkness was the final salvation for a pitiable man who desired power to protect others.